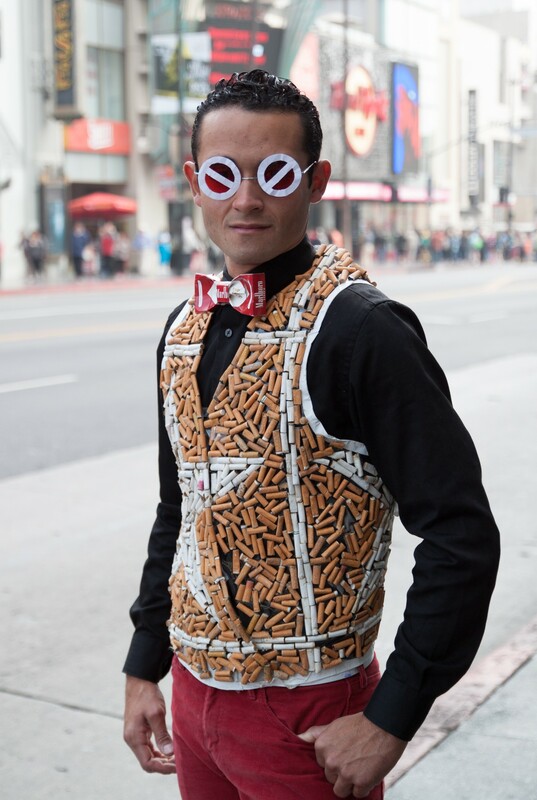 Artist TrashyB wearing a vest he created out of hundreds of discarded cigarette butts he says he collected on the Hollywood Walk of Fame. An artist says his carefully assembled outfit may appear "pretty disgusting at first," but he hopes it becomes a smoking hot topic – at least among environmentally friendly fashionistas. 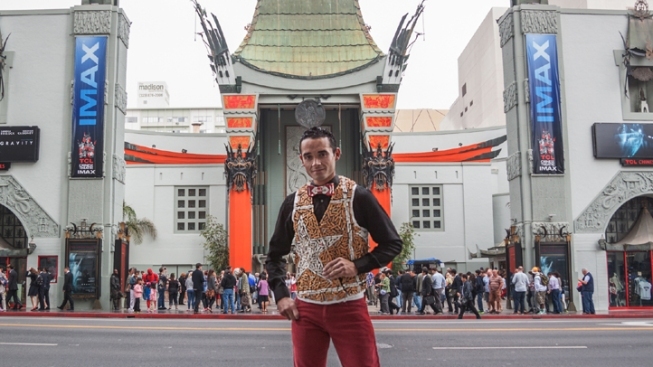 The self-proclaimed eco-artist who goes by the name of TrashyB glued together a vest using hundreds of discarded cigarette butts that he says were once littered across the Hollywood Walk of Fame. TrashyB says he is "familiar with this type of trash real well," and that he "knew I had to create something out of them." The result was a well-crafted vest with a large white star that resembles one on the famous Hollywood sidewalk, as pictured right. He also wears a bowtie made out of a cigarette package. TrashyB says he hopes his design brings awareness to smokers to properly dispose of cigarette butts so they don't end up on the sidewalk or in the ocean. "I personally don’t have the solution to this environmental problem, but if have changed people's perception of what really happens to cigarette butts, then I know I've made a positive impact," he said.